Lineage. Constituted as 391st Bombardment Group (Medium) on 15 Jan 1943. Activated on 21 Jan 1943. Inactivated on 25 Oct 1945. Redesignated 111th Bombardment Group (Light), and allotted to Pennsylvania ANG on 24 May 1946. Extended federal recognition on 20 Dec 1948. Redesignated 111th Composite Group on 1 Nov 1950; 111th Bombardment Group on 1 Feb 1951; 111th Strategic Reconnaissance Group on 1 Aug 1951; 111th Fighter-Bomber Group on 1 Jan 1953; 111th Fighter-Interceptor Group on 1 July 1955; 111th Air Transport Group on 1 Apr 1962; 111th Military Airlift Group on 1 Jan 1966; 111th Tactical Air Support Group on 27 May 1969; Inactivated on 30 Jun 1974. 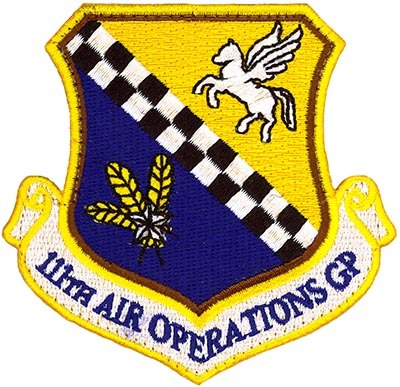 Reactivated and redesignated 111th Operations Group, 1 Oct 1995; 111th Air Operations Group on 31 Mar 2011-. Components. Squadrons. 572nd Bombardment, 21 Jan 1943-25 Oct 1945; 573rd Bombardment, 21 Jan 1943-25 Oct 1945; 574th Bombardment, 21 Jan 1943-25 Oct 1945; 575th Bombardment, 21 Jan 1943-25 Oct 1945. 103rd (Bombardment, Strategic Reconnaissance, Fighter-Bomber, Fighter-Interceptor, Air Transport, Military Airlift, Tactical Air Support, Fighter), 1 Nov 1951-30 Jun 1974, 31 Mar 2011-. 104th Fighter, 1 Nov 1950-30 Sep 1962; 117th Bombardment, 17 Jan 1947-1 Apr 1951; 1 Jan 1953-1 Jul 1956; 129th Strategic Reconnaissance, 1 Aug 1951-15 Nov 1953; 130th Strategic Reconnaissance, 1 Aug 1951-15 Nov 1953; 142nd Fighter (later Fighter-Interceptor, Fighter-Bomber Tactical Fighter), 1 Nov 1950-10 Feb 1951; 1 Nov 1952-7 Apr 1962. Assignments. Third Air Force, 21 Jan 1943; 99th Bombardment Wing, 25 Jan 1944-27 July 1945. 53d Fighter Wing, 20 Dec 1948; Pennsylvania Air National Guard, 1 Nov 1951-; 111th Air Defense, (later: Fighter-Interceptor, Air Transport, Military Airlift, Tactical Air Support, Fighter), Wing, 31 Oct 1950-. Stations. MacDill Field, FL, 21 Jan 1943; Myrtle Beach General Bombing and Gunnery Range, SC, 24 May 1943; Godman Field, KY, 4 Sep-31 Dec 1943; RAF Matching, England 25 Jan 1944; Roye-Amy Airfield, France, 19 Sep 1944; Asch Airfield, Belgium 16 Apr 1945; Vitry-En-Artois Airfield, France 27 May-27 July 1945; Camp Shanks, NY, 24-25 Oct 1945; Philadelphia IAP, PA, 20 Dec 1948; NAS Willow Grove, (later Horsham ANGB ), PA, 1963-. Curtiss JNS, 1924; O-46, 1941–1942; O-47, 1941–1942; O-49, 1941–1942; O-57, 1941–1942; F-5, 1944-1945; B-26B/C, 1946–1951; RB-29, 1951–1952; F-51, 1953–1954; T-33, 1953–1954; F-84, 1954–1956; F-94A/B, 1956–1958; F-94C, 1958-1959; F-89H, 1959–1962; C-97, 1962–1969; U-3A, 1969-1970; O-2, 1970–1982; OA-37B, 1982–1989; A-10, 1988–2011, MQ-9, 2014-. Operations. Emergency operations while under state control included flood-relief in Pennsylvania, 19–22 March 1936. Antisubmarine patrols, 27 December 1941-19 August 1942; combat in CBI, 6 September 1944-10 May 1945. Ordered to active Federal service on 10 Oct 1950-15 Nov 1952 for the Korean War. Deployed to Central America to fly with US allies who had been sold the A-37 as part of the US Foreign Military Sales program. Participated in Operation Desert Storm, 1990; Operation Southern Watch, 1995, 1999 & 2001; Operation Enduring Freedom, 2002-2003; Operation Iraqi Freedom, 2003. Develop a team of subject matter experts who are ready and able to provide critical support to the various Unified Combatant Commands of the DoD by augmenting the AFFOR staff of the USAF Major Commands. Emblem. Approved 10 Apr 1931.